There were two brothers, one named Jacob and the other Esau. Jacob was a schemer. He wasn’t happy that he was the younger of the two. It meant that his brother Esau would inherit everything from their father Isaac. With his poor old father Isaac blind and on his deathbed, Jacob dresses up in Esau’s clothes and puts goat’s skin on his arms and neck, and tricks his father into blessing Jacob and not his hairy-skinned brother. In this way he grabs every cent of the inheritance that should have gone to Esau. That’s the kind of person Jacob is. By hook or by crook he’s going get his way and he does. Getting the blessing from his father Isaac means that he will be the head of the clan, head of the family name. Esau and all the other relatives would be subject to him. Jacob gets what he wants, but as he gloats over his success, things suddenly turn sour. Esau is angry, really angry, and there’s no telling what he might do. Esau promises, “After Dad’s funeral, I’m going to kill that little shyster.” Jacob knows he would be no match against his rugged brother if it ever came to a fight. So he gets out of town, slipping out the back door. Instead of being a ruler, the head of the clan, now he’s a fugitive, an exile. He had wanted more than anything to inherit his Dad’s estate, to have it all, to be the head of the family and put his older brother in his place. Now look at him. Out there somewhere between Beersheba and Haran which is to say he was out in the middle of nowhere. Jacob, once the schemer, the grabber, so smart and cocky, is now defenseless, alone in the night, without family for protection or support, homeless, a fugitive, banished, with only the shirt on his back, sleeping on the ground with a stone for his pillow. But before we feel sorry for Jacob, note that Jacob doesn’t really feel sorry for what he’s done to Esau. Note that Jacob doesn’t toss and turn all night because his conscience bothers him. Instead he falls comfortably asleep. Jacob falls into a deep sleep and dreams. He dreams about a great stairway that is thrown down from heaven right to where Jacob sleeps. And we read, “And the angels of God were ascending and descending on it…And there was the Lord standing beside him” (28:12). And God makes a promise to Jacob. God says, “The land on which you lie I will give to you and to our offspring; and your offspring shall be like the dust of the earth…and all the families of the earth shall be blessed in you and in your offspring. Know that I am with you and will keep you wherever you go, and will bring you back to this land. For I will not leave you until I have done what I have promised you” (Gen 28:13-15). Just think about this. Here is the meanest, money-hungry, scheming, swindling low life sleeping on the ground in some unknown place because he is afraid of his own brother. God comes down and appears to him in a dream and tells him that he is blessed and that God would always be with him and protect him. That hardly seems right, does it? And it’s definitely not fair. I can’t explain it, but God showers outrageous blessings upon this mean person. Jacob didn’t deserve it but that’s the way God is. He is gracious and merciful to the worst sinner. God wasn’t happy about the misery that Jacob had caused his family, but God doesn’t abandon his people – even the worst of us. Don’t we see the same thing…in Jesus’ parable of a younger son who dishonors his father by demanding the share of his inheritance and then runs off and blows it all on wild living? And then, when the younger son returns, the father doesn’t treat his wayward son the way everyone expected, but hugs him, and reinstates him to his honored position in the family and throws a welcome home party. Don’t we see the same thing…happening to the thief who was crucified alongside of Jesus? We don’t know a lot about him but we do know that he was a criminal. He had lived a life of crime and deserved the punishment that was being dealt out to him. And what does Jesus say to him? “I promise you that today you will be in Paradise with me.” Now that hardly seems fair. But that’s the way God is, full of underserved grace toward sinners. Our sense of fairness suggests that it’s only right that we should do something before we receive so much from him. But that’s the way God is. He knows that we’re caught in sin and like Jacob try to get away with as much as possible. God could have let the young, deceitful, Jacob simply disappear during his journey through the wilderness. But that’s not God’s way of doing things! 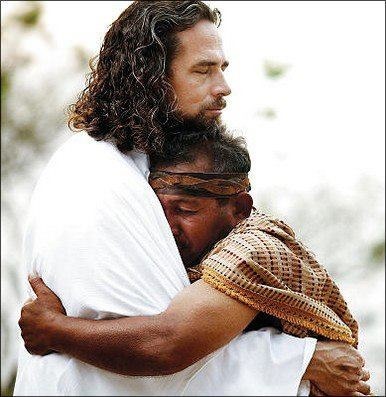 In spite of everything, he still loves us and sticks by the promise that he made to us at our baptism, “I will be with you wherever you go.” He even sent us his Son to be our Savior to reassure us of his love for us, to help us in our sinfulness, to comfort us in our troubles, to reassure us of his presence when we are feeling unloved and unlovable, to forgive us for our evil and wrongdoing. An important aspect of this story is that God came to Jacob when he was in deep trouble. That’s the way God is. He will not forget you or abandon you. There will be stormy times in our lives, when it seems like we are on our own. There will be times in our lives when we have acted badly towards others, and we may think God wouldn’t want anything to do with us. But that won’t be true. God will be there in that stormy place. The commitment of God is total. God is a covenant God who remains faithful to the promise to be with us. After waking up from that dream, Jacob got up from his stone pillow and said, “Surely the Lord is in this place – and I didn’t know it!”(28:16) Jacob was amazed that, in spite of everything he had done, God was with him, and God still cared for him. Jacob said to God, “Of all that you give to me I will surely give one-tenth to you” (28:22). IN response to God’s incredible mercy, he dedicated his life to serving God. That doesn’t mean he did everything perfect from then on – far from it – but he did recognize that God was committed to him. Whenever he had difficulties or struggles, he could reflect on God’s promises to him and remind himself that God loves even the most unworthy people in this world and will not give up on them. I’m glad we can see God’s grace in Jacob’s story. There are times in my life when I have behaved like Jacob, times that I have acted selfish and tight-fisted. There will be times in the future when I might fall into those attitudes again. But I thank God for his generosity; I thank God for sending his Son who went to the cross for us. God is good; he has given us everything. Like Jacob, our encounter with God’s grace changes us. We are refreshed, renewed, reassured, thankful and ready to recommit our lives to serving our Lord. And he has promised to be with us, to love us, to help us, and to save us. Thanks be to God for his incredible gift!